If you haven’t got the passes yet and are unlucky enough to not get the time to actually go to the almost month long festival this time round, don’t you worry as you can watch it at home as well (Although that wouldn’t even be half as entertaining as going to the original thing) but Oh well, you need to learn to make the most out of what you’ve got! Here is a comprehensive guide on How to Watch Coachella Live Online in 2019, complete with all the online viewing options you’ve got to watch the event, guides on how to bypass geo-restrictions with Best VPNs on Coachella Live streams, how to watch Coachella on Apple TV, official broadcaster lists, where to buy tickets from and more by BestVPN.co! An event that changed the course of musical festivals in the United States, The Coachella Valley Music & Arts Festival is going to be held in April this Year and you seriously do not want to miss it! Held at the Empire Polo Club at Indio, California since 1999- 2001, the festival gets its now uber-famous name from the Coachella Valley where Indio is situated. If you don’t know about this festival yet, you might have been living under a rock since the turn of the millennium because its perhaps the most defining musical event not just in the US but in the entire world for the whole upcoming year. The show’s format this time around is consecutive 3 Day Weekends in April 2019. The first Coachella weekend will continue from 12th April – 14th April 2019, while the second Coachella weekend will commence from 19th April – 21st April 2019. Featuring top acts like Ariana Grande, Tame Impala, Childish Gambino, DJ Snake, Khalid and a whole lot of others, Coachella 2019 will be dope! And it’s not just the biggest starts that Coachella is all about! This event is more about bringing the little known musical talent to the fore by giving them a platform to showcase their artistry. 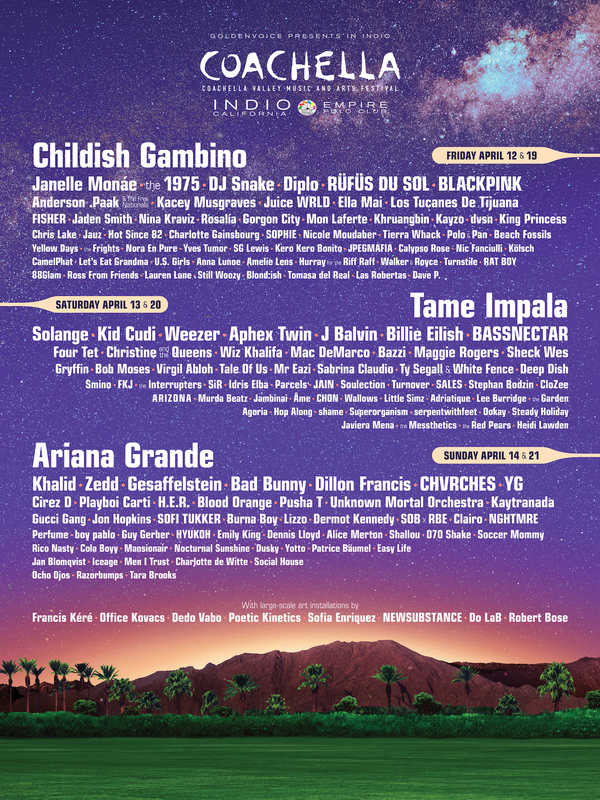 Coachella has launched a lot of small-time musicians and singers into the global popularity orbit with just a single appearance, so who knows that the 2019 line-up might feature the upcoming global sensation! Here is the full artist line up as shared on Coachella’s official site! With the most basic festival passes starting from $429, excluding other necessary amenity add-ons like Shuttle passes, hotel accommodation, camping & parking fees etc. not many of us are lucky enough to go to the Coachella festival without breaking our bank. So what’s our next best option? Watching it online from home! Well, unlike other major musical events from across the world, Coachella doesn’t stream live to any external channels or tie up with broadcasters. Instead, it has its own YouTube channel where it streams its own event live and that too for absolutely free! 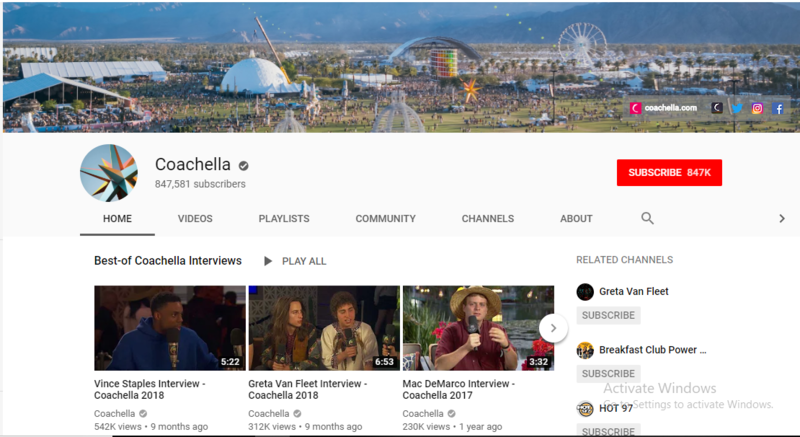 The Official Coachella YouTube Channel also has a lot more to offer including video highlights from previous Coachella events, songs from artists featuring this year and more, so do check it out! Watch the live streams online on both the two weekends and enjoy Coachella’2019’s biggest artists and stars live! Apple TV is fast growing as a highly preferred device for all kinds of online streaming and watching Coachella live on it is incredibly easy! Enjoy the live streams straight from Coachella on your Apple TV with no problem! Do note here that if you are in any country outside the US and the live stream is not showing due to geo-restrictions then don’t fear at all as all you need is a good enough VPN that offers Media-streamer service. Right now, the only Top VPN that does that on Apple TV is ExpressVPN and I can say that because I test VPNs daily. Yes, there are other good VPNs for Apple TV as well that you can read more about in our guide on the topic, but in my opinion, don’t opt for any provider other than ExpressVPN if you don’t want to spoil your Coachella event in 2019. From Where Can I Buy Coachella 2019 Tickets? Over a quarter of a million people attended Coachella last year and this time around the figures are slated to be even higher! Yes, the event is that popular, so tickets sell like hotcakes and you need to hurry if you want to get one for yourself or for others as well. The most basic ticket starts at $429 on Coachella’s official site, with some really valuable add-ons like Shuttle Trips, camping spaces, hotel accommodation, parking, VIP passes, dinner buffets and more. This event becomes more and more enjoyable as you become more and more willing to spend some good enough wades of cash. However, the irony is that the tickets have mostly been sold out on the official site and you have to join waiting lists to get them. Other options are still available but not for long and they are charging a premium for keeping tickets available. Even General admission tickets here can cost you in the range in between $530- $700/person, with other amenities like parking and camping being other cost add-ons. So if you want to go visit Coachella 2019 live in action, then the best time to buy tickets is now or either they will run out or will cost you even more! A single pass is valid for a single weekend only. Yes, Coachella is streamed live through its official YouTube Channel and it has no other live streaming options. How Much Does It Cost to Go to Coachella? A Coachella weekend can cost you anywhere in the range from $1200 to over $2600 depending on how luxurious you want the event to get for you. The Average cost however is $1500 for the whole weekend from Friday to Sunday. AirBnB or Sleeping in your car will help keep the costs down. How Old Do You Have To Be To Go To Coachella? Attendees need to be adults i.e. at least over 18 to attend the event with an official ID that can be used to verify their age at the event by the management. Coachella is one of the biggest and most extravagant music and arts festival in the United States, featuring top stars and artists spread over 2 consecutive weekends. Whether you decide to go to the event or watch it from your home live online, Coachella 2019 is an event not be missed at all. Headliners include Ariana Grande, Tame Impala, and Childish Gambino and tens of others, promising it to be the event of the year! The official YouTube Coachella Channel is there to get you all the event’s live streams and in mostly good quality, so subscribe to it fast. VPNs can also help those watch those watch Coachella who are facing geo-restrictions on the YouTube channel, opening up the event for everyone in the world! If you have any questions or issues regarding the event’s live streaming, do mention it in the comments field below!